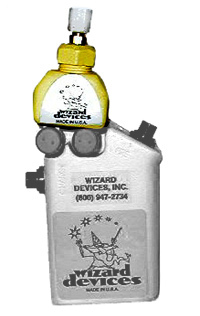 The WIZARD "ARC" STI is an electrical plasma discharge device, which attaches to the "WIZARD 50G2" Mini Blasting Machine. The high tech electric plasma discharge generates a shock wave, which is designed to initiate shock tube (NONEL). The "ARC" STI lugs are placed into the spring-loaded contacts on the "WIZARD 50G2". Once attached, the user starts the normal charging and firing sequence. The addition of the "ARC" STI attachment linked with the "WIZARD 50G2" makes a perfect combination for all well-rounded explosives professional. The WIZARD "ARC" STI is safe, dependable, and simple to use. The "ARC" STI is miniature in size, 1¼" x 2¼" x 1". Solid state, high impact plastic construction will provide many years of dependable service. The "ARC" STI plasma tip can be easily replaced, simply pulling out the used tip, and replacing it with a new tip. all in less than a minute. Insert the end of the shock tube through the Ferrell nut until it touches the tip, pull the shock tube out approximately 1/8" to ¼", creating a gap for the tip to fire and generate the plasma shock wave. Tighten the Ferrell nut to hold the shock tube in position. Place the "ARC" STI lugs into the spring-loaded contacts on the "WIZARD 50G2". Start the charging and firing sequence as normal for the "WIZARD 50G2". Note: NEVER attach a ready to fire "ARC" to a fully charged blasting machine. ALL STANDARD SAFETY PRECATIONS APPLY.